For your first spiral rope, choose two colors of beads. 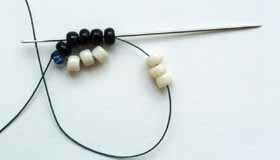 Size six beads are an easy size for your first shot at this pattern, but any size will work. When I teach children how to make a spiral rope bracelet with size 6 seed beads, I measure out one teaspoon of beads in their core color and one tablespoon of beads in their outside color. Fireline, Nymo D, and Silamide are all good threads for this. I also use Conso upholstery thread with size six beads, especially for kids, as it seems to tangle less than other threads. 1. To begin, thread your needle with your thread of choice. 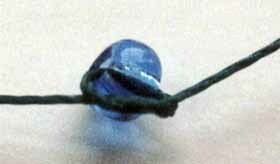 Tie a stop bead about 6 inches from the tail of your thread. 2. String on 4 beads of your core color, followed by three beads of your outside color. 3. Bring the needle back to the beginning and run the needle through the core beads again. 4. 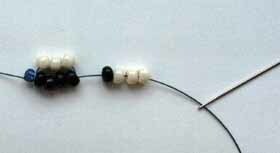 Add one core bead and three outside beads. 5. Bring your needle back around and through the last four core beads (three that were already there plus the one you just added). Tighten up your thread as you push the outside beads firmly to the right to rest firmy against the previous loop of outside beads. 6. Repeat this, adding one core bed and three outside beads, then going through the three most recent core beads plus the new core bead, pushing the outside beads to the right as you pull your thread tight. The correct tension, as shown at left, is tight enough to force the core row of beads to form a spiral while the outside beads are kept close to the core. Incorrect tension usually looks something like this. The tension is too loose. 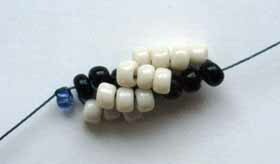 The outside beads fall to the side and reveal the entire line of core beads. 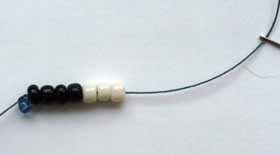 The core beads form a relatively straight line compared to the correct tension in the picture above.